which nestles on the southern Dalmatian coast of Croatia and where English is widely spoken. 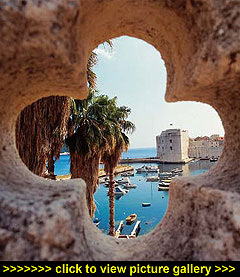 The city state of Dubrovnik rivalled Venice for power and influence. Over the centuries, many races and countries have since left their mark. Dubrovnik even boasts Europe's oldest working pharmacy which, as it was established in 1315, may also be one of the world's oldest businesses. Dubrovnik's much-publicised distress in the 1991/2 war was a mere blip on the radar of its history. Restoration work quickly reinstated the beauty of the city to possibly its best condition in hundreds of years. Tourists have returned, but the city has retained its integrity and a vitality of its own. You can still buy your vegetables and flowers at the daily market in Luza Square, with its backdrop of stately Venetian buildings: the Rector's Palace, the cathedral and the Franciscan Monastery  not to mention the nobleman's palazzo which is now an elegant boutique hotel. The imposing town walls of the old city guard a treasure trove of historic churches, monasteries, picturesque squares and stepped alleyways  all lovingly preserved without any hint of ugly neon signs. A walk along the city walls will provide not only spectacular views of these treasures but an intimate glimpse into the lives of the local inhabitants. This one-hour walk and climb is best undertaken out of the heat of the midday sun and can be broken into two halves should you wish, as there are two entrances  Pile Gate or beneath St. Nicholas's Church. There are many diversions to be had within this car-free stage set (featured extensively in the recent Casanova television series) with its polished marble main thoroughfare, the Stradun, which cuts through the heart of the old town. Here you can take a break from sightseeing, have a drink and watch the centuries old tradition of people promenading or just going about their daily business. Dubrovnik has a surprisingly-pleasant pebble beach, a short walk from the centre; but as an alternative take a ferry from the old harbour over to the small island of Lokrum to swim. There is a small ruined fort, set within tropical botanical gardens together with a restaurant, next to the cloisters of a ruined monastery. An ideal place to relax and wile away some time. A phial of Dubrovnik's Ragusa rose oil has recently been recovered from the wreck of the Titanic. The original scent was one of a set of perfume phials created by Adolphe Saalfield, a German Jewish immigrant who lived in Manchester. He was taking the perfume essence to America in the hope of making his fortune. Mr Saalfield survived the tragedy but, crushed by his experience, did not resume his perfumery business. You can still today sample a rose liqueur made by traditional methods from the same ancient type of roses. A local skilled self-taught chef, Pavo, prepares not only delicious gourmet meals but also his own specialist liqueurs. Venturing outside the old city of Dubrovnik has its rewards. Take the local bus for about £1 each way or the seasonal ferry for the ten-mile ride to the attractive village of Cavtat. The village is set on a small thickly wooded peninsula, the stepped streets rise behind the palm- lined quay around the bay. There are some interesting old houses dot-ted around and if you wend your way up towards the high point, you will come across a tiny alfresco bar. Here you can enjoy terrific hospitality and views of the harbour down across the village roofscape. Or perhaps sit in one of the cluster of restaurants and pavement cafes on the quayside and simply watch the world go by. Further afield is the Gulf of Kotor and its historic eponymous city where the architecture is equally historic to that of Dubrovnik, but with a different emphasis. Again, the local daily bus and organised tours are available. What to say about Budva in Montenegro? Sadly this historic close-knit seaside town was hit by an earthquake. The restoration monies were spent elsewhere and the second round of funding was used in an unsympathetic manner. Therefore the ancient mini town with its maze of cobbled streets, small squares, restaurants, cafes and bars is made over to the tourists  a theme park, no longer a 'living town' as none of the locals still live within its ancient walls, but just cater to those who stay in the large surrounding hotels. the Stone Age. Reputedly the birthplace of Marco Polo, it has a long sea-faring tradition. Korcula Town is known as 'little Dubrovnik' because of its ancient town walls encompassing medieval squares, churches and palaces. The island is proud of its local culture, including the unique and spectacular Moreska sword dance which is performed regularly in the town during the summer. Whichever way you travel to Korcula you will be tempted to return as you will pass by the magic Elaphiti islands. These are charming, with lots of individuality, and even boast of a few of the rare sandy beaches as well as the rather grand Venetian-styled summer houses of the rich Eighteenth Century Dubrovnik merchants, together with a castellated fort. is the three lakes. In the middle of the largest is an islet on which sits an hotel which was formerly a monastery. If you go by road, you will see some small villages along the Peljasac peninsula nestling into the hillsides by the shore. We visited one some-time ago called Trstenik which has a small tamarisk-lined foreshore. Some time ago we worked out that it had a restaurant and despite no common language but willingness on both sides, we concluded that the place only opened two weeks a year at that time. However, the rapid spread of ex-pats buying houses is changing the social landscape quickly; the locals are astute and moved the prices even quicker  there is more than a hint in that observation! An island further afield, but still possible to visit by the seasonal ferries, is Hvar. This is an island with a rich heritage and scented by lavender fields. The idyllic small Hvar Town boasts a Venetian palace, Europe's oldest theatre and other architectural treasures it would be a shame to miss. One can continue to cite a whole string of places to go and experien-ces to enjoy. People travel some thirty miles along the tortuous coastal road from Dubrovnik to the hamlet of Mali Ston just to visit one of the renowned harbour-front fish restaurants. The locals by far out-number visitors, always a sure sign that the restaurant rates well. Inevitably, one is more indulgent with the meal than expected! One way to com-pensate is to walk across to Ston, Mali Ston's larger and massively- walled neighbouring village. Walk to the top of the latter's fortificat-ions, which climb steeply up the mountain, and you should have burnt off all the excess calories.